Not to be confused with Shy Guy Jungle. 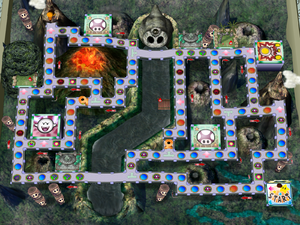 Shy Guy's Jungle Jam is a jungle board hosted by Shy Guy in Mario Party 4. He built it because he is too timid to go out on an adventure in a real jungle, so he made an artificial one for his friends to have fun in. Here, Shy Guys are everywhere, and are put in charge of the games and shops (the one hosting wears an explorer's hat and vest). The main attractions here are the Shy Guy mountain and Klepto the condor. The Happening Spaces are in front of two Shy Guy Wells on the board. Players who land on these make either a happy wish or a sad wish to the Shy Guy statue. Either way, the result is random, though the probability is in favor of the following events depending on the wish chosen. If the statue likes the wish, a little fanfare comes, causing nothing to affect the board. If it does not like the wish, it gives the player an angry look. This also causes the mountain to flood the middle of the board, cutting it in half for up to 3 turns. If the player lands on these spaces again while the river is flooding nothing happens. Klepto can be found resting at the top-left corner of the board. Players who get to him wake him up. He then asks if the player wants to cross the river for 5 coins. If the player accepts, Klepto takes the player to the other half of the board. Along the way, players can steer left or right to collect coins in the air (and from the volcano eruption if one happens). A Shy Guy on a raft also takes players across the river for a random price. The Item Minigame, Treasure Tree, involves three items hanging from a tree. They sway left and right, and players need to time their jump to hit the item they want. The Coin Minigame, How High, Fly Guy?, involves winding up a small Fly Guy. The more the player winds it up, the higher it goes; its maximum height determines the number of coins. In Story Mode, if the player beats their opponents on the board, Shy Guy challenges them to a Minigame called Archaeologuess in order to win his present.